CHENNAI: As her family fights another drought, steeplechaser Lalita Babbar quietly strolled into record books at the Asian Athletics Championships on Saturday. She not only secured an Olympic berth but also broke her own national record (also a meet record) with a gold-winning effort of 9:34.13, a notch above the Rio qualifying standard of 9:45.00. Born in an agrarian family in the drought-ridden Mohi village in the Satara district of Maharasthra, Lalita’s life was a perpetual battle with the mundane chores of life, like fetching water and helping parents in farming. The fury of nature, she admits, forged a strong fighting spirit in her. “Water was always a rare commodity. We had to cultivate wheat and jowar when even drinking water was a rarity. That experience of taking on the adversity head-on helped me develop fighting spirit,” she told Express from Wuhan. Lalita’s entry into athletics was also dramatic. Initially dabbling with Khokho, she switched to athletics in her teens. The dashes she had made in fields enhanced her endurance and she was sure which stream to pursue. “ I had a proper assessment of my endurance as I used to cover a lot of ground in our field. So from the first moment itself, I knew I would be doing long-distance running,” she said. Lalita was into marathon and 5000m running till 2014, though she had developed a liking for steeplechase from 2010. “ I wanted to do steeplechase alone. But I can’t comply forsake marathon and road-running as prize money was needed to provide my family. Whatever I got as salary (she joined Railways in 2009) went for my training. So I had no other choice but to do marathons,” she said. 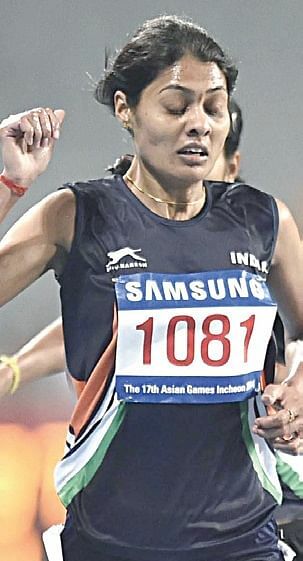 However, after the Asian Games bronze medal in Incheon, Lalita began fully focusing on 3000m steeplechase. “ I knew it was my event. Obstacles always thrilled me. Facing obstacles from childhood, they no longer scare me. Once I won an Asian Games medal, I decided to ditch other events. Though much money is in the offing, I won’t run long-distance races,” the 26-year-old explained. Though disheartened at the stepmotherly treatment of athletes, Lalita is happy that her feats have attracted more girls to sports, especially in her village. “When I joined, villagers rebuked my parents for allowing me to go outside the village. Girls running and jumping was never encouraged. But after I began earning medals, situation has begun changing. Now girls from Mohi have started doing sports”. Lalita has her plan set for Rio. “Before that I will run in World Championship but that is only to test my preparation. Coach Nikolai Snesarev has given me a program and I am closely following it,” she said. Wuhan: Along with Lalita Babbar, ace discus thrower Vikas Gowda also won the yellow metal as Indians produced an impressive show to grab three medals on the third and penultimate day of the 21st Asian Athletics championships. 31-year-old Gowda successfully defended the title he won in 2013 in Pune, though he came up with a below-par effort. Tamil Nadu’s G Lakshmanan fetched a silver as he won his second meet medal with a brilliant 10000m race clocking 29:42.81.